Swedish-made fighter could solve ROCAF’s air-defense, acquisition problems. The Republic of China Air Force (ROCAF) appears to be a formidable force on paper, wielding 300-plus fighter jets (excluding the obsolete F-5E/F used for training), but its most recent purchase was 150 F-16A/Bs and 60 Mirage 2000s, both approved in 1992. Earlier this month, Taiwan’s President Ma Ying-jeou reiterated the need to procure advanced fighters from the United States in order to fulfill the pending shortage of Taiwan’s air power projection capabilities. The shortage will come due to the retirement of older F-5 jets by 2019, as well as the government’s desire to retire its current batch of Mirage 2000-5Di/Ei. The sale of American F-16 C/D fighters has been in limbo for years; with Republic of China (ROC) officials recently stating that they no longer wish to pursue such a purchase. While there have been statements issued by the ROC government expressing an interest in acquiring the F-35 5th generation fighter currently in development by the United States, the likelihood of such a sale is unrealistic at the moment due to reasons that range from the high per-unit cost and American concerns of a harsh Chinese reaction to the sale, to Taiwan’s position at the bottom of a long waiting list of other countries which have already completed agreements with the United States for the F-35. One option would be for the ROCAF to look elsewhere. Although the Russian market produces impressive fighter jets with competitive price tags, it is closed to Taipei due to Moscow’s close relationship with Beijing, as well as its rather rigid interpretation of the One China policy. Moreover, the introduction of Russian weaponry would create another logistical headache because, under current conditions, Taiwanese jets already need to use a range of US, French, and Taiwan-made missiles on their planes, and the availability of spare parts and general service requirements would be another issue complicating their use. Other options are no less complex. The Eurofighter Typhoon is expensive, and France most certainly would not risk angering China by offering to sell Taiwan its Rafale fighters. Taiwan, however, could choose to think outside the box in terms of seeking to acquire new jets by looking at Sweden’s JAS-39 Gripen. Granted, the political ramifications that make sales difficult are not insignificant, and in many ways are not too different from the cases outlined above. Nevertheless, the Gripen would fit well with Taiwan’s defense needs, and pursuing the bid would be a worthwhile effort, even if it ultimately is destined to fail. A sale, however unlikely, would make sense for both sides for a number of reasons. For Taiwan, adding the Gripen into its air-power portfolio would be a major upgrade in terms of overall capabilities. The newest model, the JAS 39E, would come packed with improvements over previous models. Such upgrades include a multispectral sensor suite—a system that allows the aircraft to engage stealth targets—and the ability to fly at Mach 1.25 without the use of afterburners. Moreover, the Gripen comes equipped with the Meteor ramjet-powered air-to-air missile, which is believed to have five times the lethality of the American-made AMRAAM. The Gripen has another quality that makes it suitable for Taiwan’s conditions. As a result of Sweden’s own precarious position due to its close proximity to Russia, Sweden has always stressed the short take-off and landing (STOL) capability for its fighter jets. That also suits Taiwan’s needs very well, as part of the latter’s plan is to utilize highways and other large paved roads in times of war. F-16s and other jets in the ROCAF inventory are capable of STOL, but unlike the Gripen, they are not expressly designed for that purpose. Sweden has also made its previous agreements buyer-friendly; with perks that have included an offer to Indonesia that encompasses a 100-percent technology transfer, as well as an agreement with Brazil that will result in the South American country building nearly 80 percent of the airframes domestically that it purchases from Sweden. 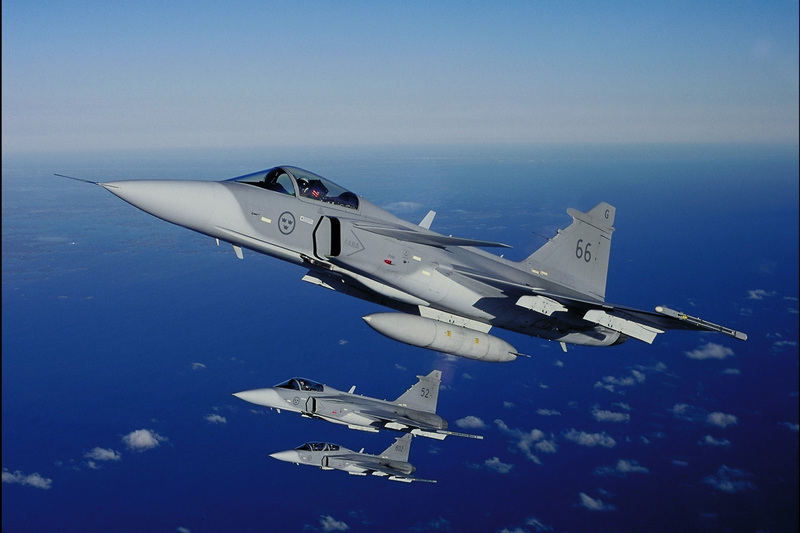 If Taiwan were to be able to negotiate a similar offer in a Gripen sale, it would be a major boost to its domestic aviation industry, particularly for the country’s Aerospace Industrial Development Corp. This would, of course, be an ideal scenario, in which Taiwan would be relieved of the logistical burden of relying on imported spare parts. While Sweden might, under certain conditions, be willing to sell Gripens to Taiwan, agreeing to licensed production is a whole different matter. European manufacturers offer licensed production to keep their products competitive against US companies that are usually unwilling to offer such deals (Japan is a notable exception, together with partner countries in the F-35 JSF program).Thus, this particular scenario works well when the seller is competing with other offers, and Taiwan’s major problem is that sellers are not exactly lining up to sell weapons to the country. Perhaps equally important as performance is the issue of cost, and the Gripen appears to be a bargain. The per-unit price tag of Switzerland’s recent purchase of 22 Gripens is believed to have been near US$150 million. This amount also includes training, technical support, and spare parts. The platform is also efficient to fly and maintain, as it has an estimated per-hour operating cost of nearly US$7,000 and only requires six support personnel to handle maintenance—an efficient number that the demographically-challenged Taiwan would welcome. In contrast, per-unit cost estimates of the F-35 have been unreliable: While the Pentagon and Lockheed Martin hope to bring down the cost of the various F-35 models to below US$100 million, the final price tag for each unit may very well reach twice that amount. While per-unit estimates vary, the per-hour operating cost of the F-35 can be pegged at nearly US$31,000 per flight hour, and although the total flying hours of the entire fleet is still relatively low, this would not bode well for budget-conscious legislators in Taiwan, who would not be keen to share these numbers with their constituents, especially considering the government’s plans to move forward with another expensive outlay: the ROC hopes to build four submarines of its own by 2025. Considering all the above, it should be stressed that per-unit costs are not a very reliable indicator, as there are multiple variables affecting price. Thus, these figures need to be taken with a grain of salt. Ultimately, it also depends a great deal on whether Taiwan would be able to secure a military contract, or if the sale would go through civilian intermediaries, with the latter option making the sale and servicing significantly more expensive. Nevertheless, it is safe to assume that overall costs of a Gripen purchase would be much cheaper than the F-35 alternative currently being speculated about. Arguably, a Gripen sale would not need to be put forward as a competing alternative to an equally hypothetical F-35 sale: Rather, it would be an interim solution that would allow the ROCAF to retire some older combat planes without necessarily replacing their original roles (such as in the case of the Mirage 2000, which is a high-altitude fighter; a role for which there is no clear replacement) and ease the burden on the existing fleet. Moreover, Gripens can be easily integrated with existing ROCAF armaments, which would ease the logistical burden associated with acquiring a completely new plane. All things considered, there are of course fairly obvious political obstacles on the road should Taiwan’s government proceed with the request. If the United States feels compelled to stall the sale of F-16C/Ds for nearly a decade, allegedly over worries about the Chinese reaction, why should Sweden be any different? One counter-argument is that Sweden’s economic links with China are not particularly strong: In 2012, China constituted just 3 percent of Stockholm’s exports, and 4 percent of imports. The second argument is that the sale of 60 JAS-39E/F would be the most successful foreign sale for the Swedish aerospace company Saab by a long shot. More so considering that the market for jet fighters is shrinking. Russia, France, and the United States are producing fighter jets domestically. India recently concluded a deal for the French-built Rafale. Other potential buyers are off the table due to their involvement in and standing orders for the F-35 program. There is no other offer on the horizon that could potentially be as good as what the Taiwan offer could be. Third, some elements in the United States would be interested in making the sale happen, too; the Gripen still has several US-made parts, including the F414G-39E engine, and thus certain US defense contractors would still benefit from the deal. That being said, obstacles do not end with Stockholm’s potential worries about retaliation from Beijing; London has the capability to block the sale due to sensitive UK-made parts (especially the scanned-array radar) used in the Gripen. Britain is arguably more economically entangled with China than Sweden is, though not significantly more so; with 3 percent of exports and 8 percent of imports in 2012 (although one could argue that this imbalance would make China be the one to feel the pain, should it move to restrict trade). Moreover, Saab is heavily invested by the influential Wallenberg family, which also owns companies like Ericsson and Electrolux that have strong investment stakes in China. Thus, whereas incentives for the sale are strong, obstacles are formidable, too. As noted above, Taiwan’s disadvantage is that its options are generally limited to US-made platforms in the absence of competing offers. In other words, Taiwan is usually at the wrong end of a monopoly scenario. At the very least, pursuing an acquisition elsewhere could serve to re-energize the long-stalled F-16C/D deal. If all else fails, there is one more lesson that Taiwan can learn from looking at Sweden: A relatively small non-allied nation determined to defend its territory against a potentially hostile great power with the capability of developing its own high-quality weapon systems (albeit in cooperation with other states, technology-wise) ranging from excellent submarines and offshore defense corvettes to capable jet fighters. There is a sense of acknowledgement among Taiwan’s defense planners that domestically built weapons are increasingly the better choice within a narrow field of options. There is no doubt that it would take a great deal of effort to develop the know-how and requisite investment in human resources. Cooperation with the United States would be required as well, but that may be less of a problem as selling parts may be less controversial in Washington circles than selling combat-ready platforms. Taiwan is not yet in a situation to become like Sweden in terms of its own defense industry, but it very well may be in 20 years’ time. Long-term investment in developing this capability has to start at some point, and there is no better time than the present. This piece was originally published in Strategic Vision vol. 3, no. 18 (December, 2014). *Brian Benedictus is a Washington D.C.-based foreign policy analyst specializing in East Asian security issues. He is also an Asia-Pacific Desk analyst for Wikistrat. Brian owns blog Warm Oolong Tea and tweets @Roosley. There is also the very real possibility the swedes will decline the technology transfer to Taiwan as giving anything to the ROCAF is pretty much the same as handing it directly to Beijing. Well America must realise any sales to Israel is effectively the same as handing the technology directly to Beijing but they still do it.